Today I'm sharing my Zentangle Tile #133. When it was finished, I decided I wanted to add some colour to it so that photo follows this one. I scribbled Zig Clean Colour Markers onto a plastic palette, then picked up the colour with a water brush. Zigs always give such bright, beautiful colours. 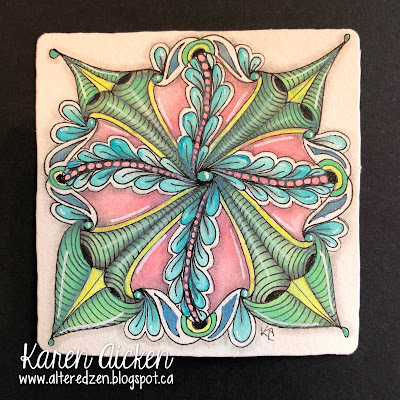 I decided to add some colour to my previously posted Zentangle Tile #131 and I'm quite happy with how it came out. I painted the areas with diluted Distress Oxide Inks and a water brush, added a few highlights with a white gel pen and used my new white charcoal pencil as well. I liked all the black on this one! 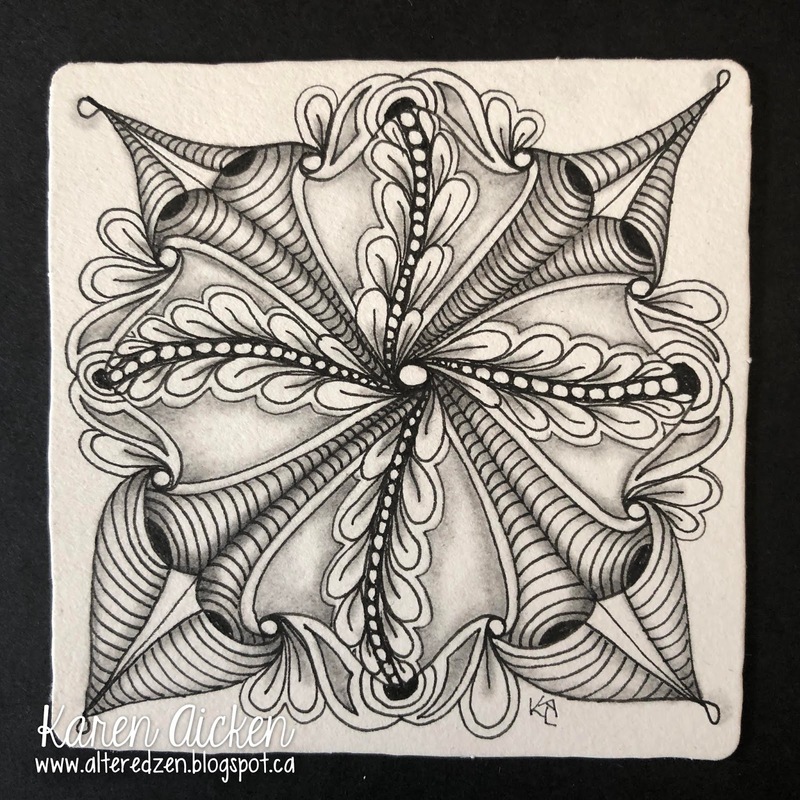 I have had this thing about posing my Zentangle in the same order I do them. On my card blog, this rarely happens so I don't know what I was so obsessed about keeping things IN ORDER here. 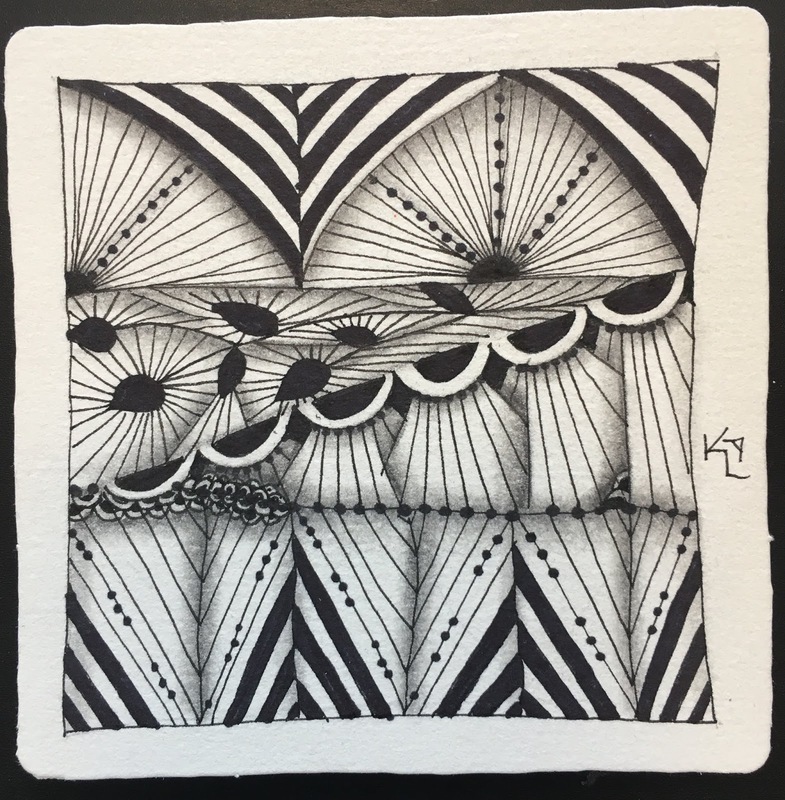 It has stopped me from posting numerous times, so I'm tossing that out the window and will just post my Zentangle pieces as I wish. I have to say, it feels SO good to be back in the swing of things. 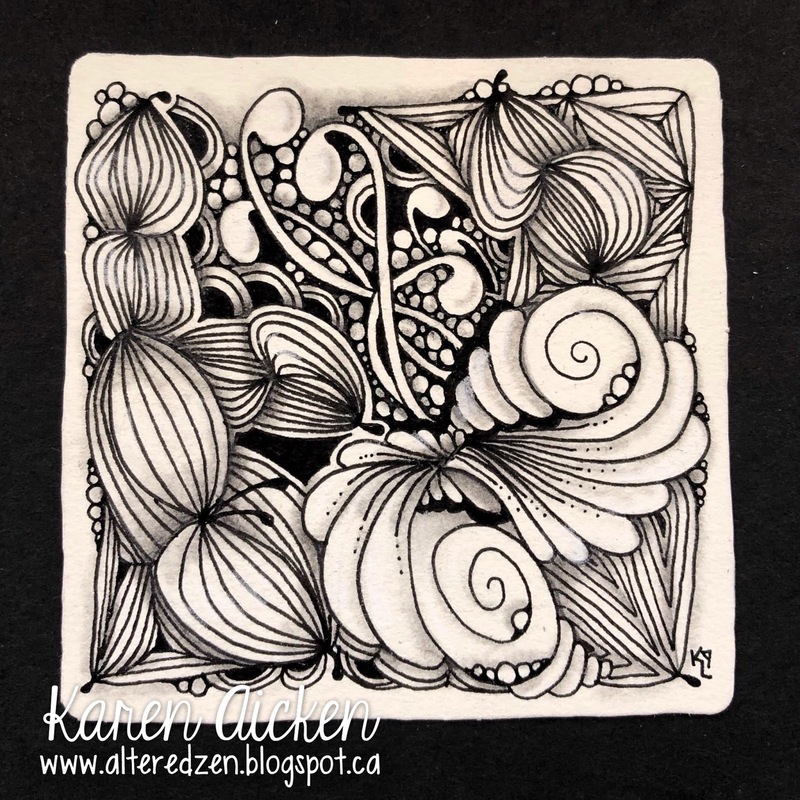 I'm rusty - but the zen of Zentangle came back to me within seconds of starting this tile. I also had a bit of fun with Well Well Who, adding some Flux and Tipple, with some extra lines and aura's too. 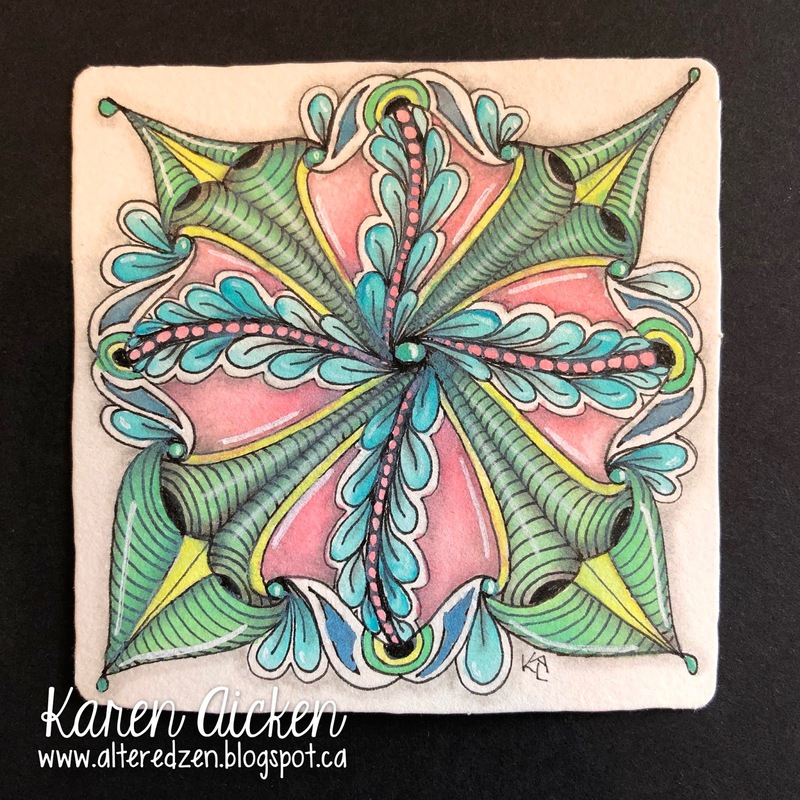 I looked at the tile again a few hours after completing it and decided since the Zentangle community is now embracing colour I would add colour to it. I also ordered myself a white chalk pencil, so when it comes and I have a play with that and will post the coloured tile later this week. It has been far too long since I've posted here. I have so many tiles still to post but it's been awhile since I actually did a tile. 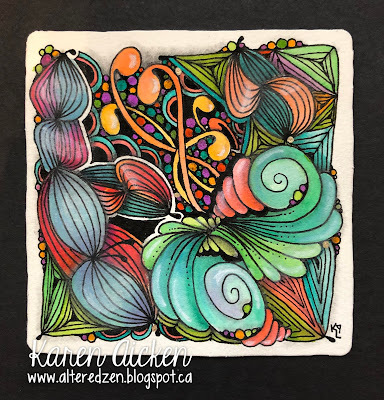 I have had a cool opportunity to try out some brand spankin' new, not even on the market yet markers and doing a tile with them has rekindled how much I love and miss my Zentangle. This is an older tile, done a long time ago. Since I can't share the new tiles for a few weeks, I thought I'd share this one instead. I used String #246 from Tangle Patterns. 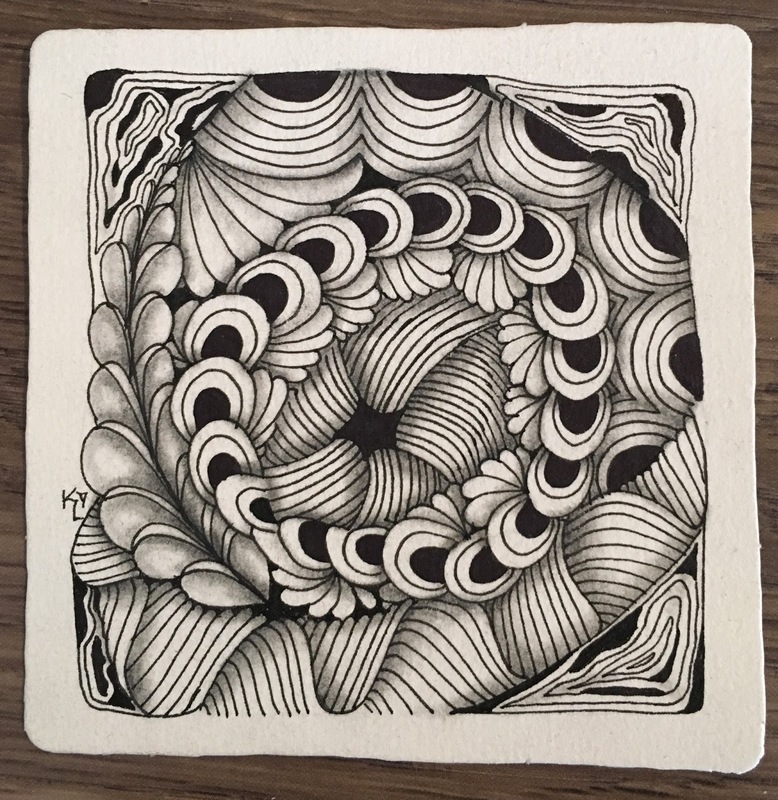 It would appear things changed since I stopped paying attention to the Zentangle world. Now there are shaped tiles (circles, triangles, panoramic) and so many artists are using COLOUR now. So fun! I don't have my pens handy, but I did find a stash of tiles and hope to play again soon. 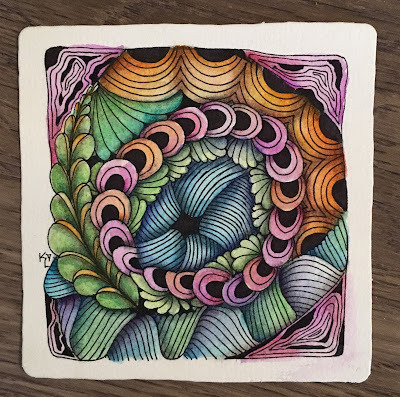 Once I finished the tile I shared on Sunday, I thought I'd like to add a little colour to it. This is always such an experiment for me - I never know where to add the colour or how things will blend. But this turned out nice! 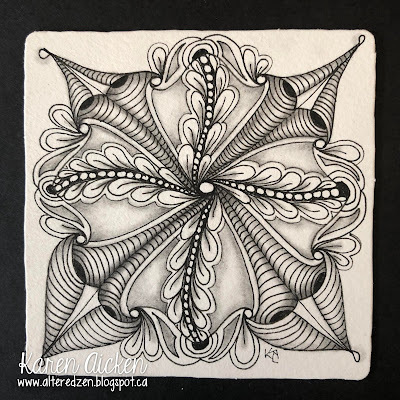 Repeating what I posted on Sunday, below is the Zentangle tile, which started with String #245 by Barbara Finwall on TanglePatterns.com. Colour was added by scribbling Tombow markers on a palette and picking up the colour with a water brush for painting. I added some Aura lines as well. 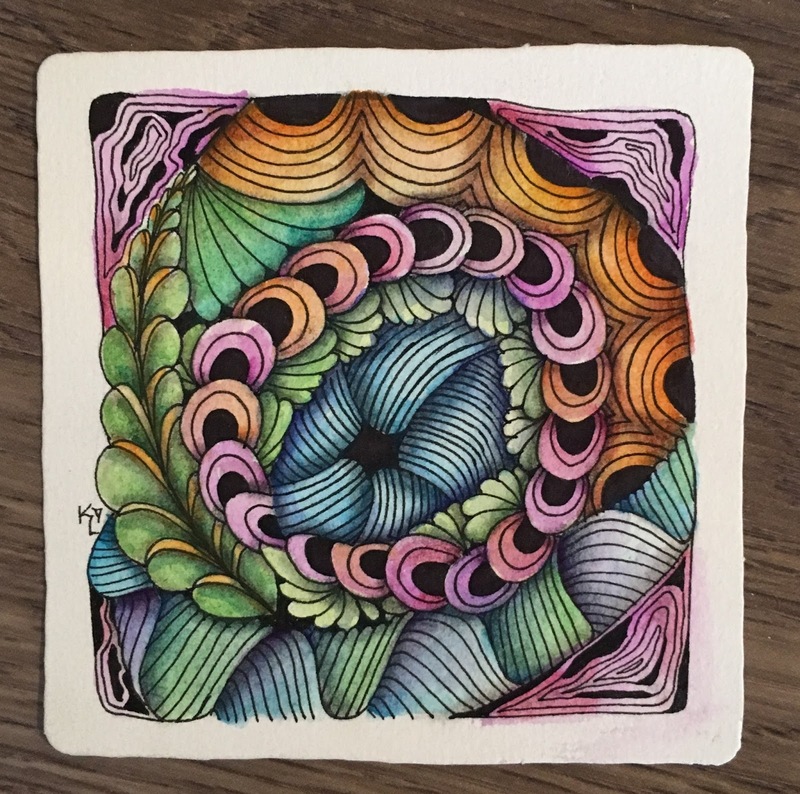 When I was finished, I decided I wanted to try adding some colour, so I'll share the outcome another day. 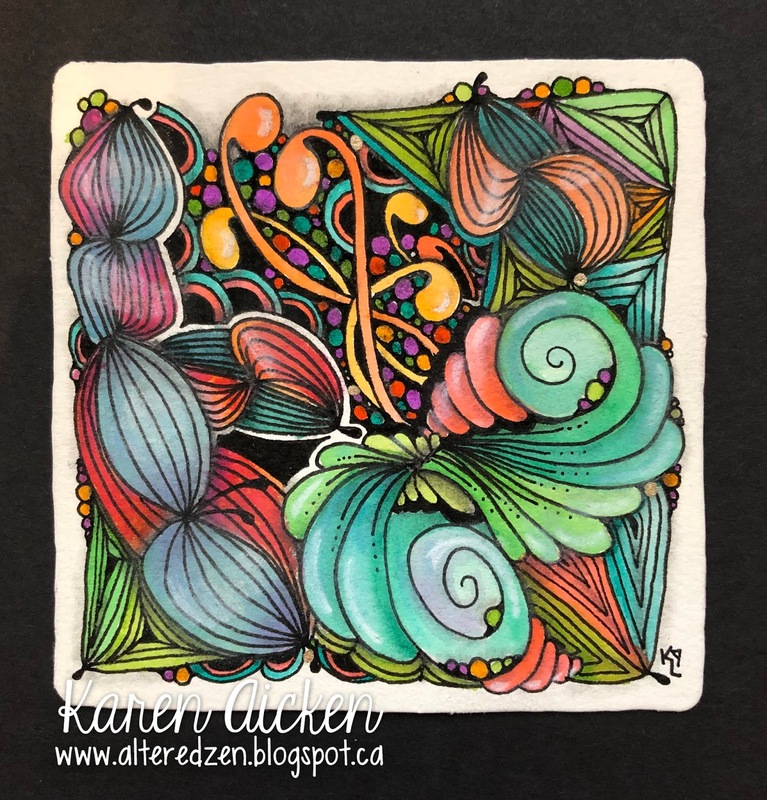 Altered Zen Blog is a personal hobby blog with the sole purpose of sharing paper crafting projects. I don't make use of any personal information shared in any comments or any third-party applications such as email subscription services. 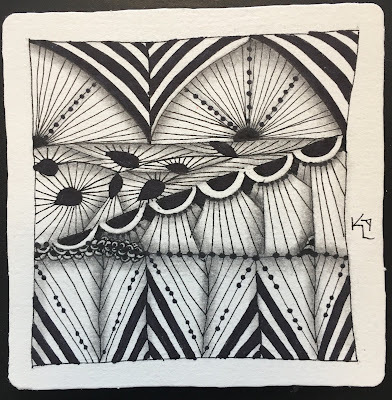 The Zentangle® art form and method were created by Rick Roberts and Maria Thomas and is copyrighted. 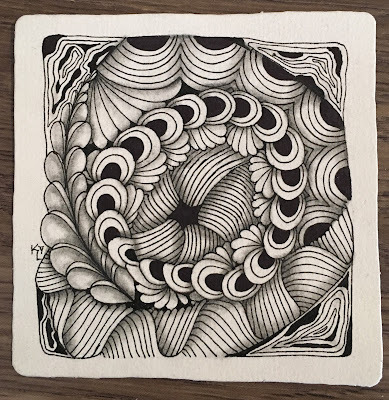 Zentangle® is a registered trademark of Zentangle, Inc. You can learn more at zentangle.com.